And no one on The Left understands less than liberal filmmaker Michael Moore. Moore went on MSNBC’s Hardball with Chris “Tingles up the leg” Matthews and accused President Trump of using Carryn Owens as a political pawn, a photo-op to strengthen his speech. First of all, I am willing to bet everything that Carryn Owens agreed to be there because of the President’s sensitive and empathetic handling of her husband’s death. Upon hearing of Chief Ryan’s death, Trump called Carryn and not only offered his sincere condolences, but also received permission to attend the memorial service. Trump made it clear that there was to be NO press. None. …first to the President of the United States, who we are all so deeply committed to. And I’ve spent some time with him. I can tell you with marching out to Dover to watch Chief Owens come home, and watching the President witness that. I saw the makings of, not only a great president, but a Commander-in-Chief that I will fight with. He is sincere. He loves his country. And he makes good decisions — especially the Vice-President. President Trump did the right thing by inviting Carryn Owens, giving her the opportunity to have a front stage seat to watch the nation show their great love and honor for Ryan, her courageous husband. But that’s not how Hollywood heavyweight Michael Moore saw it. 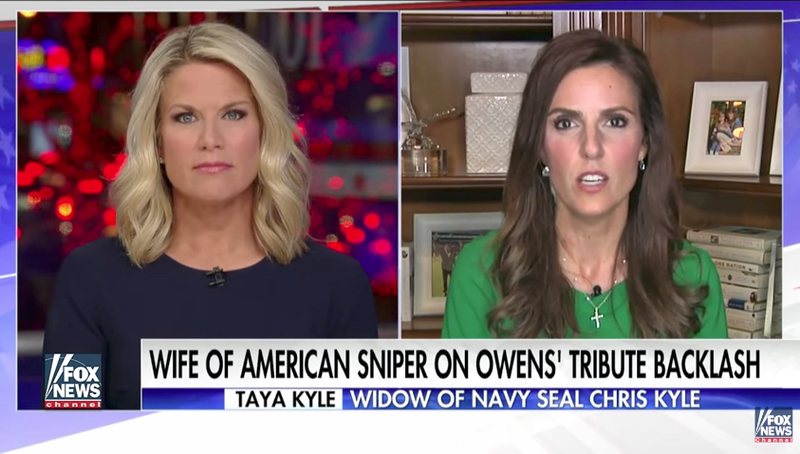 Fox News anchor, Martha MacCallum, host of “The First 100 Days,” had American Sniper SEAL sniper Chris Kyle’s widow, Taya Kyle, on to react to Moore’s despicable comments. And boy did she ever. Taya, a Fox News contributor since summer 2016, trained her verbal crosshairs on Moore’s big head and let him have it. Just listening to those clips I have a myriad of emotions going through me. I can tell you when I hear the applause and I hear the words being spoken about Ryan, I’m not thinking about politics in the slightest. What I’m thinking is that my heart is pounding and I have chills because it’s truth. Because this is a silent professional and his intensely private family who gave everything, they never wanted recognition. And if somebody now that he’s gone wants to get up and thank him for his sacrifice, for his service, to tell the world his name, to tell he’s out there serving, then God bless him! And you know what? For his beautiful wife to get up there, she’s so private. For her to get up there and say “I’m going to do this because I love my husband, and because he’s worthy of this praise. He deserves this recognition and for once he doesn’t have to be the silent person.” For her to stand up and receive that for him is beautiful. You asked about my feelings on what Michael Moore said? It makes me sick to my stomach. It makes me angry. Because he’s saying two things when he says that, to me. He’s saying a) she’s a fool and doesn’t know she’s being used. And that’s RIDICULOUS, it couldn’t be farther from the truth, and [b] it’s also saying that this wasn’t warranted. That in some way this has to always be political. I get the idea that it would be nice to say everything is a political ploy. It totally negates, though, the meaning behind this. And the meaning of it, for all the people watching who cried with her, is that some valiant people are out there fighting — not for Republicans, not for Democrats — they’re fighting for this country and God bless them for doing it! Taya’s wonderful words summed up the feelings of millions of patriots who watched Carryn Owens and did cry with her. I cried with her. that from these honored dead we take increased devotion to that cause for which they gave the last full measure of devotion — that we here highly resolve that these dead shall not have died in vain — that this nation, under God, shall have a new birth of freedom — and that government of the people, by the people, for the people, shall not perish from the earth. That’s what Donald Trump was doing. That’s what tearful Americans were doing. We were all telling Carryn Owens that her warrior husband, U.S. Navy Special Operator, Senior Chief William “Ryan” Owens, did NOT die in vain. God bless you Carryn and your children. May God bless the memory of Ryan Owens. And God bless President Donald Trump for understanding the value of Ryan’s sacrifice to our nation. Chief Owens did not fail.